This is La Dame Chinoise on the reverse side of the mug. Between the two chinoiserie prints are two prints of butterflies. This Derby mug is printed with floral swags below which are L'Oiseau Chinois (shown here) and La Dame Chinoise on the opposite side. 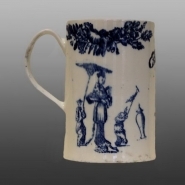 Both of these prints appear, also in underglaze blue, on a bell shaped mug in the British Museum, which is marked with a sun, an anchor and the name Derby. The anchor is a rebus for Richard Holdship. L'Oiseau Chinois and La Dame Chinoise first appear as overglaze prints at Worcester. They are inspired by Boucher's Elements.